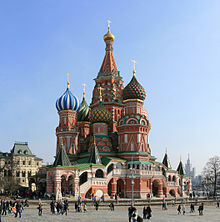 The Cathedral o Vasily the Blessed (Roushie: Собор Василия Блаженного), commonly kent as Saunt Basil's Cathedral, is a kirk in Reid Squerr in Moscow, Roushie. ↑ Popova, Natalia (12 July 2011). "St. Basil's: No Need to Invent Mysteries". Moscow, Russia: Ria Novosti. Archived frae the oreeginal on 12 July 2011. Retrieved 12 July 2011. ↑ "List of federally protected landmarks". Ministry of Culture. 1 June 2009. Retrieved 28 September 2009. ↑ "Cathedral of the Protecting Veil of the Mother of God". www.SaintBasil.ru. Retrieved 8 August 2013. This page wis last eeditit on 26 September 2015, at 01:35.